Habe jetzt 3x Wappenrock der Flamme erhalten. Außerdem jede Menge T3-Setteile für andere Klassen und 2x Mythic Gear für meine eigene Klasse. Was hoping for a loot table when i saw this item, but it will be awesome to see what items they will bring to the black market auction house when WoD hits. Bought the first available one on Nesingwary-US for 6250 gold. Sattel des Sohnes von Galleon was inside. Just bought one as of WOD. Ring der rasiermesserscharfen Klinge EDIT: Wowhead doesnt show it by specific ID anymore but it is mythic quality. Bought one now on Defias Brotherhood EU, second one since expansion. Cost me 44,500g and contained Katzentransportkorb (Siamkatze). There was a Tirisfal Batling inside for 5500g. bought 2 more containers received Wabernder Klumpen and Schössling von Teldrassil both pets unfortunately, proves these are a massive gold sink..
these crates are essentially a gamble. you can get something amazing or you can just get a rock. Can contain a random one of these items: wowhead link. However, this does not include the outdated MoP raid/PvP gear. Don't bother looking at the 'contains' tab on this page. The sample is too small to be reliable. I just got a Schlagkraftarmplatten des wilden Gladiators in my priest. Sad. Credits to Wowpedia, WoWwiki and Wowhead (also, users kellyislame and rhinoloupe). 5º Muster: Blitzfäuste http://i.imgur.com/92EwiPB.jpg (I thought it would not come Pandaria items, but came - recipe at least. Opened a ticket, and one GM say that the content inside the box is totally random, which include the outdated MoP raid/PvP gear and recipes. There is this list: http://www.wowhead.com/items?filter=cr=181;crs=1;crv=0 0 - which bring all the itens selled in black market and can come in this box (except outdated gear). I hope the zulian tiger isn't something you can get, but my experience of these from MOP was 50/50, i've bought 4, 1 time i got a heroic piece of gear i could use, another time i got a pvp paladin human piece and then got a rogue piece (these all bought on my mage) and then bought one for 5k flat, and got the drake that drops from al'akir. Bought my third container today and thought i would share what i have gotten so far on those 3 attempts. 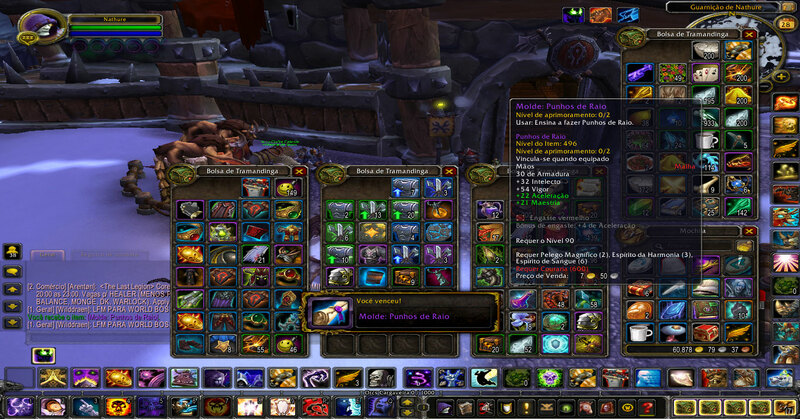 Tonight, the bid on this container is up to 50k on my small server (Garrosh). I've only been checking in religiously since I got the BMAH access in my garrison and this is a good 20k higher than any bid I've seen previously. For those of you that monitor the BMAH, is this common? 50k seems like an unreasonable gamble. "Ein Gegenstand, der in einer vorangegangenen Auktion versteigert, aber nicht abgeholt wurde. Vorsicht beim Öffnen."